Acute lower back pain is caused due to a back muscle strain or ligament strain. Lifting a heavy object, twisting, or a sudden movement can cause muscles or ligaments stretch or develop microscopic tears. How to do Single Knee to Chest Stretching? Hold thigh behind the knee and bring one knee up to the chest. How to do Hamstring Stretching? Slowly straighten the knee until a stretch is felt in the back of the thigh. How to do Cat Pose Stretching? Round your back up towards the ceiling until you feel a nice stretch in your upper, middle, and lower back. 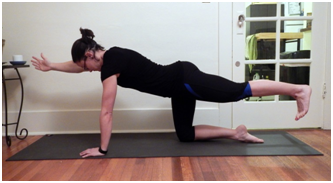 Return to the starting position with a flat back while you are on all fours. Let your back sway by pressing your stomach toward the floor. Lift your buttocks towards the ceiling. How to do Press Up Stretching? Lie on your stomach, & support your body with your forearms. Press your elbows down into the floor to raise your upper back. As you do this, relax your stomach muscles and allow your back to arch without using your back muscles. As you press up, do not let your hips or pelvis come off the floor. How to do child Pose Stretching? Get down on your hands & knees, and rest your buttocks on the heels. Take your hands forward to lengthen your spine till you feel a stretch in your middle back. How to do Quadruped Opposite Arm-Leg Lifts? Extend one leg and lift the opposite arm until they are in line with the body. Repeat with other arm & leg. How to do Curl Stretching? Hold your knees and bring them up to chest. When you sit or lie down, ensure that your lower back is supported well with a pillow. Sit with your back straight, especially while sitting in the car. Always keep your knees and hips at the same level. Sit only for short intervals. Try sleeping on your side with your knees slightly bent and a comfortable pillow placed between the knees to avoid exerting the back. While lifting, stand as close to the object as possible, bend only at the knees while keeping your back straight. Secure your grip on the thing and lift it by straightening your knees. Avoid lifting heavy objects if possible. Keep your back straight when performing house chores like mopping, using the vacuum cleaner, working with a lawn mower, etc. Do not sit on soft couches, as it does not enable you to sit straight. Do not go out for running if your lower back is hurting. Do not slouch, as that makesthe back curl,as a result exertingthe lower back. Do not bend forward at your hipwhile getting up. Do not jerk and lift anything. Do not wear high heeled uncomfortable shoes.